You can't tell me this doesn't look tasty. This recipe came about because of two separate grocery store shopping trips. One made me desire something, the other was a lucky find. The first came about on an evening run to our local grocery. I spotted 30 oz cans of mango pulp on sale. I had never seen 30 oz cans of mango pulp before. They’re big. I wanted one, but passed it by because I couldn't think of a use for it. The second was a happy coincidence the next day. I went to our grocery close to work and found previously frozen sea scallops on sale. They’re the big ones – at big cost. Usually they will set you back $16/lb. This day they were the relatively inexpensive $10/lb. Still too much but it had been a long time since we bought scallops. No wonder, with the usual cost what it is. Scallops are best simply seared with salt and pepper. Don't crowd them in the pan. That's a common mistake. So I decided that scallops would be it. Although that left my craving for the mango unabated. Simple answer? Do a nice little Thai sauce with mango. But could I find that can of puréed mango at the grocery close to work? No. That’s three times recently that particular store has failed me. No daikon, no fresh okra and now no canned mango purée. I don’t really understand the last one, because it was for sale (a large display of them) at the same store just 6 km away. So I had to settle for a smaller can of mango slices. More expensive canned mango slices. I guess I should be thankful I found them at all. You can use fresh mango, of course, but they’re notoriously difficult to peel and pit. I also thought that puréed would save me from having to break the mango up in the sauce. At least canned slices are already soft. I also chose canned because I could be pretty certain the fruit was completely ripe. Under ripe mango can taste a little like pine and if you don't know mango well it's easy to pick one up that's still green. Thai food has some pretty identifiable flavours. It has four fundamentals that balance each other in most dishes: hot, sweet, salty and sour. Luckily these can be found in some pretty easy-to-find ingredients. Hot – chillies, sweet – sugar and/or fruit, salty – fish sauce, and sour – citrus. There are usually a lot of ingredients in Thai dishes which can be daunting to home chefs. But it’s the harmonious mingling of all those ingredients that make Thai food so special. Thailand certainly punches above its weight class in worldwide representation. I doubt there are many who haven’t experienced at least one Thai dish, two of the most common being Pad Thai or Tom Yum Soup. Why not try a little Thai in your own kitchen? Although probably not completely authentic, this one's pretty easy. And it hits all the signature notes you look for in tasty Thai food. It’s also pretty fast. The scallops are quickly seared first, and then the sauce is made in about 6-8 minutes. This one will be on my stove again, to be sure. If you’re looking to step gently outside of the familiar give this recipe a try. It’s definitely a keeper. Simmer the sauce ingredients until nicely thickened. Heat the vegetable oil in a wide sauté or deep frying pan. Place the scallops in the hot oil and season with salt and pepper. Sear on one side until they let go of the pan and are browned. Turn and sear the other side. Do not crowd the scallops in the pan. Cook in batches if you must. Crowding will steam the scallops and not sear them. 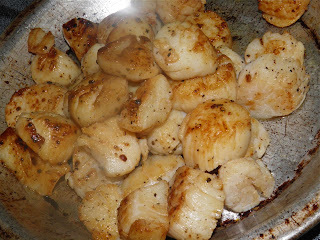 Remove the scallops to a pan as they cook and keep warm. Add the garlic, ginger and chillies to the pan. If necessary add the additional tablespoon of vegetable oil. Sauté for about 1 minute. Add the drained mango slices, coconut milk, fish sauce and sugar. The amount of sugar will depend on the sweetness of the mango slices. I used 3 tablespoons of sugar. Let the mixture cook until it is a sauce consistency. The mango will break up as it cooks, but help it along with the edge of a spatula or spoon. It’s best to have very few mango pieces in the finished sauce. Remove the sauce from the heat. 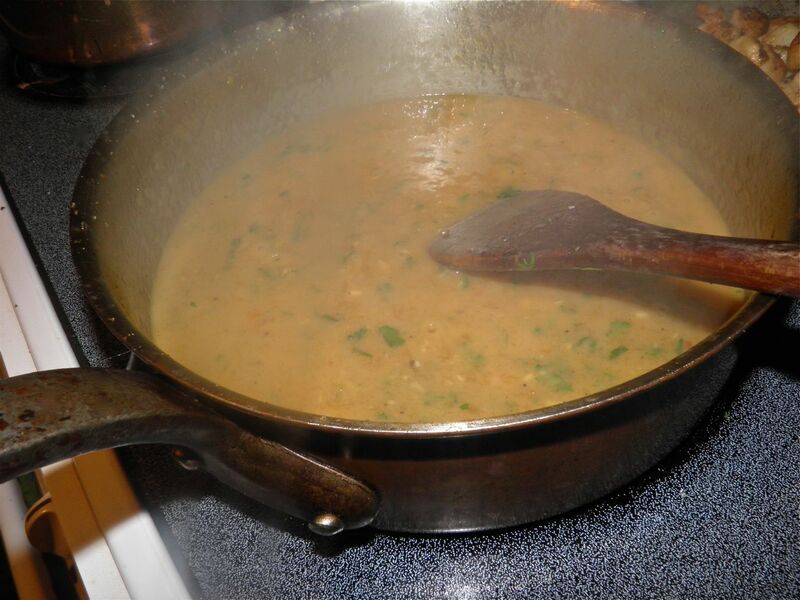 Stir in the lime juice and cilantro. Taste for sugar and fish sauce. Adjust if desired. 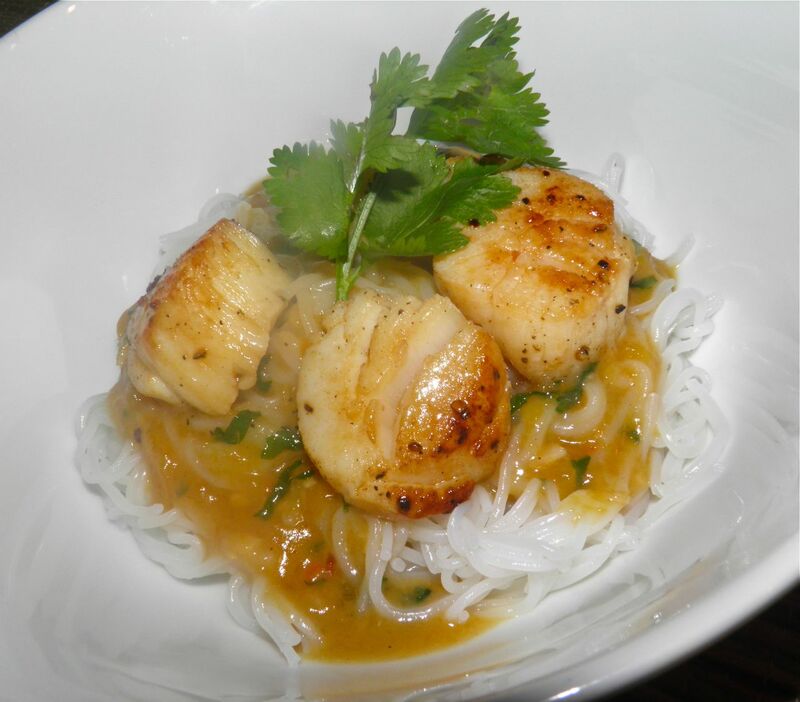 Serve the sauce on top of rice vermicelli, with scallops on top of the sauce.